Heads Up: New and potentially more complex W-4 form due by 2020. For now, this is still being reviewed with the next draft due around May 2019. The goal is to have an updated W-4 for the 2020 tax season. The new form referenced up to 12 other IRS publications to fill it out. It was so complex and different from the previous W-4 form that Ernst & Young worried employees would struggle to fill it out correctly and employers may need to offer training beforehand. This is a very good reason for payroll users who have not upgraded from older versions to move to Payroll 2.x ASAP since it’s unlikely the older Sage payroll will be updated to manage a more complex federal tax computation. 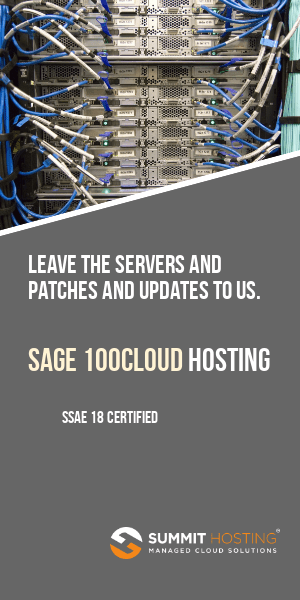 Sage 100 Payroll 2.19.2 was released on April 2, 2019 and is compatible with Sage 100 2018.1 and higher. For more information on the latest Sage payroll release visit this site. Versions 4.5 and higher of Sage 100 are fully capable of meeting ACA reporting requirements for 2015. These versions, which must also have the latest product update and IRD installed, will work in conjunction with the Aatrix tax filing services for producing fileable ACA reports. IRS Notice 2016-4 today extended the deadline for most ACA filings for the 2015 information reporting requirements (both furnishing to individuals and filing with the Internal Revenue Service (Service)) for insurers, self-insuring employers, and certain other providers of minimum essential coverage under section 6055 of the Internal Revenue Code (Code), and the information reporting requirements for applicable large employers under section 6056 of the Code. Specifically, this notice extends the due date (1) for furnishing to individuals the 2015 Form 1095-B, Health Coverage, and the 2015 Form 1095-C, EmployerProvided Health Insurance Offer and Coverage, from February 1, 2016, to March 31, 2016, and (2) for filing with the Service the 2015 Form 1094-B, Transmittal of Health Coverage Information Returns, the 2015 Form 1095-B, Health Coverage, the 2015 Form 1094-C, Transmittal of Employer-Provided Health Insurance Offer and Coverage Information Returns, and the 2015 Form 1095-C, Employer-Provided Health Insurance Offer and Coverage, from February 29, 2016, to May 31, 2016, if not filing electronically, and from March 31, 2016, to June 30, 2016 if filing electronically. For more information on completing the ACA reporting within Sage 100, please review this webinar recording. 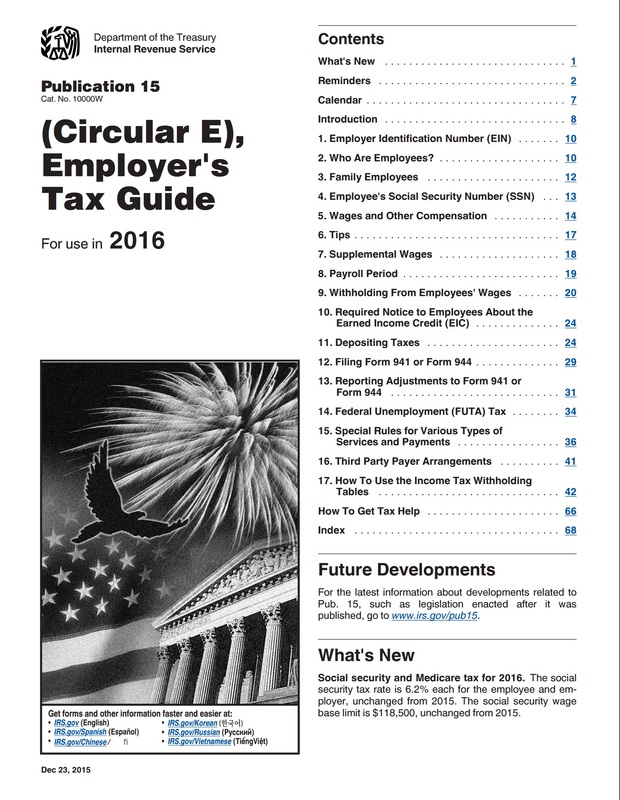 As of January 1, 2013 the IRS have not yet released Publication 15 – Employer’s Tax Guide. This booklet typically includes the tax withholding rules as well as percent method withholding tables some use to update their computer withholding. In the interim the IRS have released Notice 1036 which includes the social security limits and rate as well as percent method withholding that is presently in effect as of 1/1/13. Important: These rates may change as the government votes on pending tax legislation so be sure to check back with the IRS and update any rates as required. With the government appearing to reach agreement on taxes for 2013 there should soon be an updated set of tax guides for use by employers in the new year. Publication 15 is the usual guide that companies use for their payroll withholding lookups and verification of employment rules throughout the year. Because of the uncertainty around the 2013 tax status many of these guides have not been updated (yet) for the coming year.